Easy to manoeuvre, load, and store, the unit sets up quickly without any tools and is ready to go to work in seconds. It rolls through standard single doorways in the upright position, no need to remove the load or tilt back to the lift. The operational rear transport wheel assembly also lows manoeuvrability on uneven surfaces. Legs fold up and attachments are removable for easy storage and loading. Plus, a hold-down bar that secures the mast assembly during transport. 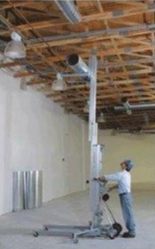 This heavy-duty, manually operated lift is suitable for warehouse work and on-site tasks such as ducting and ventilation installation. Available with a full range of useful accessories including extension forks, pipe cradle, boom, barrel stacker, and platform. Ideal for construction firms and all types of contractors, the Genie Superlift Contractor is well suited for industrial application and HVAC installations. This unit can be easily operated by one person and can lift, lower, and move loads up to 65 lbs. Contact one of our experts today in Croydon to hire one of our genie lift units, available to clients across London.